Fossils in Florida: Prehistoric Animals found in Florida. Facts about Fossils in Florida, Photos, and other Prehistoric Fun! This site is all about Fossils in Florida and More. What Treasures can be found here? No one place can give you so many facts, photos, and information about Florida's ancient past. Want to see Prehistoric Mammals? See pictures of unique specimens found while collecting or hunting here. Learn about Saber-Toothed cats or Saber Toothed Tigers. How about Mastodons and Mammoths? Information on Giant Woolly Mammoths, the Cave Bear, Cave Hyena, and the Cave Lion. Facts on Prehistoric Sea Creatures or Prehistoric Sea Monsters? No Dinosaur bones are found here - Florida was underwater at the time they lived. But you can read about raptors, Spinosaurus, Tyrannosaurus and other Dinosaurs. 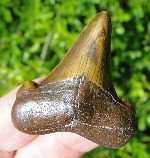 Learn about Megalodon Teeth or Prehistoric Shark Teeth. Carcharodon Megalodon Sharks could get as big as a bus. Check out the animals of the Pleistocene or Ice Age. Learn about the early Miocene. We have a wealth of information for identification purposes. There are many animals similar to the La Brea Tar Pits here. Florida has an area called "Bone Valley" that produces wonderful specimens. Learn about the Cenozoic of Florida! The state has many of the Prehistoric Animals of North America. The list of Prehistoric Animals and Ice Age Mammals include the American Lion, Birds, Bear-Dog, Bison, Camel, Deer, Dire Wolf, Giant Capybara, Gomphothere, Giant Armadillo, Giant Beaver, Giant Short-Faced Bear, Glyptodont, Scimitar Cat, Giant Ground Sloth, Three-Toed Horse, Prehistoric Horses, Rhino, Giant Land Tortoise, Alligator, Crocodile, Agatized Coral, Tapir, Peccary, Manatee, Dugong, Dolphin, Porpoise, Turtle, Snake, Terror Bird, Fish, Prehistoric Sharks, and More! The Fossils in Florida Blog keeps you up-to-date with what’s NEW, what’s CHANGED and what’s been ADDED to the www.fossil-treasures-of-florida.com web site. Subscribe FREE here. Free monthly fossil newsletter containing fossil facts, information and Paleontological Discoveries of Florida. 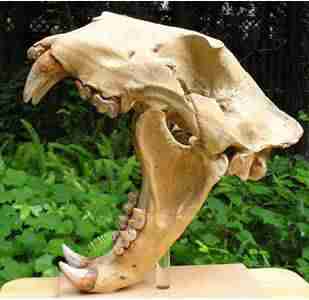 Prehistoric Ice Age Bear fossils, fossil Bear found, and the fossil Bear record in Florida. A list of Fossil Birds with information about each. Learn about the Prehistoric Birds of Florida! Cat Fossils and Big Prehistoric Cat Facts & Photos. Prehistoric Big Cat fossils, fossil Sabertooth Cat, and other large fossil Cats of Prehistoric Florida. Prehistoric Fossil Fish of Florida! There were many prehistoric fish and fossils from ancient deposits in Florida. Prehistoric Horse fossils can be discovered all over Florida. Florida was an ancient home for many diffent types of horses. Mammoth Mastodon Facts, Information and Pics. Mammoth Mastodon information of these prehistoric animals. Prehistoric Marine Mammal Fossils with Facts and Photos. Prehistoric Marine Mammal Fossils from Florida. Florida had a numous prehistoric marine mammals over millions of years. Prehistoric Reptile Fossils of Florida and elsewhere! Prehistoric Shark Fossils from Florida, North America, and other places around the world. Prehistoric Mammals with fossil information about each. See Prehistoric Animals of Florida! Prehistoric Mammals from the Fossil Record of Florida! About Us at Fossil Treasures of Florida. Learn about us and why we set up this website. This is the Fossil Treasures of Florida - Contact Us Form. The best place to contact us. Site Map for fossil-treasures-of-florida.com website.